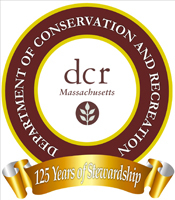 Stoneham Volunteers, in partnership with the Massachusetts Department of Conservation and Recreation (DCR), was delighted to be hosting a unique team of invasive removal specialists in the Fells: goats! 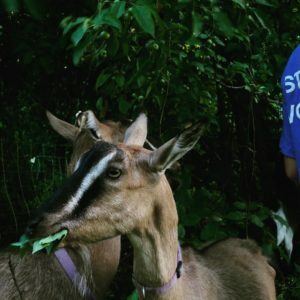 During the week of July 24-29, four goats took up residence near the Botume House Visitor Center in Stoneham to help manage the park’s more aggressive invasive plant species. Goats love to eat brush and invasive plants, and offer an environmentally-friendly alternative to herbicides or mechanical interventions. On the menu for the goats at the Botume House was glossy and common buckthorn, Oriental bittersweet, multifloraose, and porcelain-berry–all carefully selected by DCR’s Fells staff, state ecologists, and Friends of the Fells botanists. 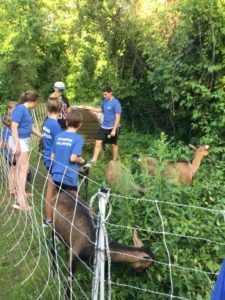 “Goatscaping” is the newest trend in invasive plant removal! Essentially goats love to eat everything in their path. Invasive plants are time consuming and difficult to remove (bittersweet jams chainsaws) so we tried this technique to pilot how efficient they are as invasive removal specialists. How did you manage to rent them? 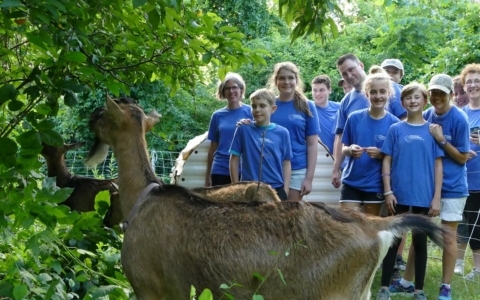 A brand new nonprofit called Stoneham Volunteers loved the idea of goatscaping so much they offered to sponsor a week in the Fells. Where are the goats from? Most of the invasive plants in the area of their pen near the Tudor Barn, which includes Asian Bittersweet, multiflora rose, buckthorn (glossy and common) and Porcelain-berry. Goats will clear everything from 4-6 inches to 5-6 feet off the ground; whatever they can reach. Is there anything they can’t eat? Yes. Certain plants are toxic to goats. While they’ll avoid most of these plants instinctively, we did make sure their pen was clear of Rhododendron, azaleas, and pokeweed. Is their poop good fertilizer? YES! Goat manure is odorless, can be directly applied to soil without composting, is free of seeds, and is richer in nitrogen than that of cows or horses. The hope is the low ground cover they fertilized (grass, clover, ferns, mosses) will take over and help keep out new brush growth. The electric fence not only kept the goats in, but protected them from coyotes and dogs. The solar fence charger produces the same voltage output as an Invisible Fence for dogs. It gives a brief unpleasant zap, but will not injure anyone, including children and seniors. 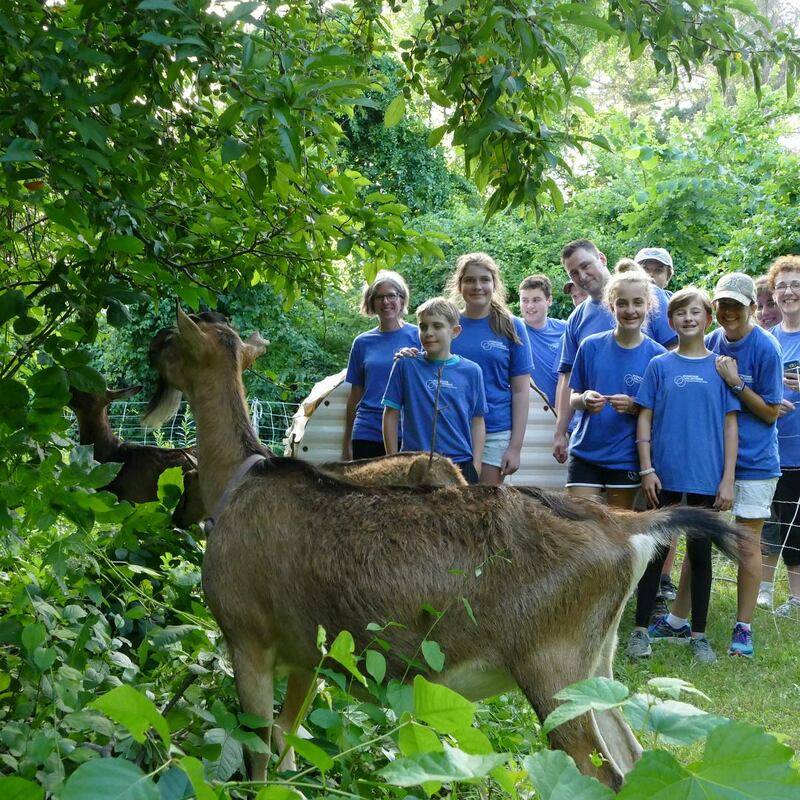 We provided a shelter, so the goats happily stayed in their fenced enclosure. Will I get poison ivy if I pet the goats? You could! But our goats won’t be near very much, if any.